Whether it is for exercise, relaxation or as a sport, it is an undeniable fact that swimming is an excellent way of relieving stress and keeping fit. Swimming pools are the places people go to when beaches and rivers are out of the question. But swimming can go downhill very quickly from being a very enjoyable experience to being very irksome and bothersome in the matter of a few minutes. In the absence of pool steps, hauling, hefting and hoisting yourself and your little ones out of the pool can detract from the fun of the pool very quickly. Some above ground pool ladders do float away or are wobbly and are not very safe for anyone to step on. That necessitates a very good, sturdy and safe pool steps. 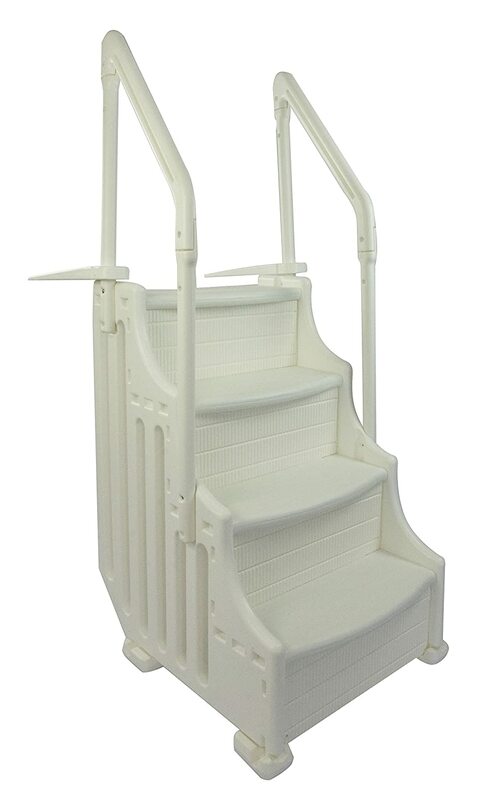 This review is that of the best five above-ground pool steps and ladders currently available. 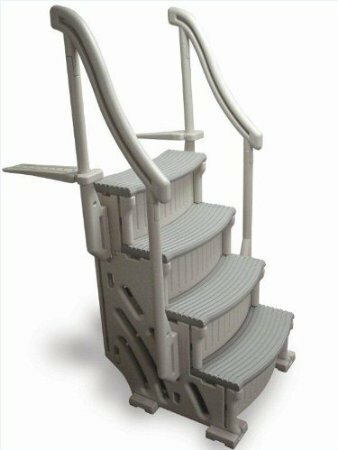 And if you are on the lookout for new pool steps for your swimming pool, then this review is just what you need. Whether your swimming pool has a decked landscape or not, the Blue Wave Easy Pool Step for Above-Ground Pool is perfect for you. Even if you do require an outside ladder, this pool step is sold with a ladder combination. With this above ground pool step and ladder, going into and coming out of your pool is as easy as anything you can think of. This above ground pool step and ladder is manufactured from polyethylene and can fit into any pools that have a depth of at most, 54 inches. 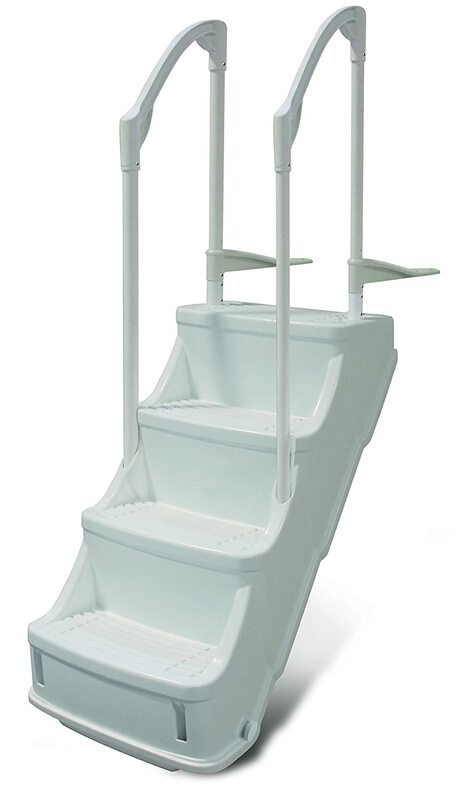 It has dual handrails, the steps are big and wide and are slip-resistant, and it is also easy to maintain and clean making it one of the best pool steps there are. The steps are easy and safe to use for both young and old swimmers. It is easy to put together and has a maximum weight limit of 350 pounds. Each one of these steps has holes in them. The holes allow for the circulation of chemicals and water to prevent the growth of algae and microorganisms. This step can also be easily removed during winter. To give more stability, you require sand of about forty pounds to fill the posts. You can also use water to fill in the posts to weigh the pool step down. Each step is about 12 inches in height and is not too steep as to be uncomfortable. 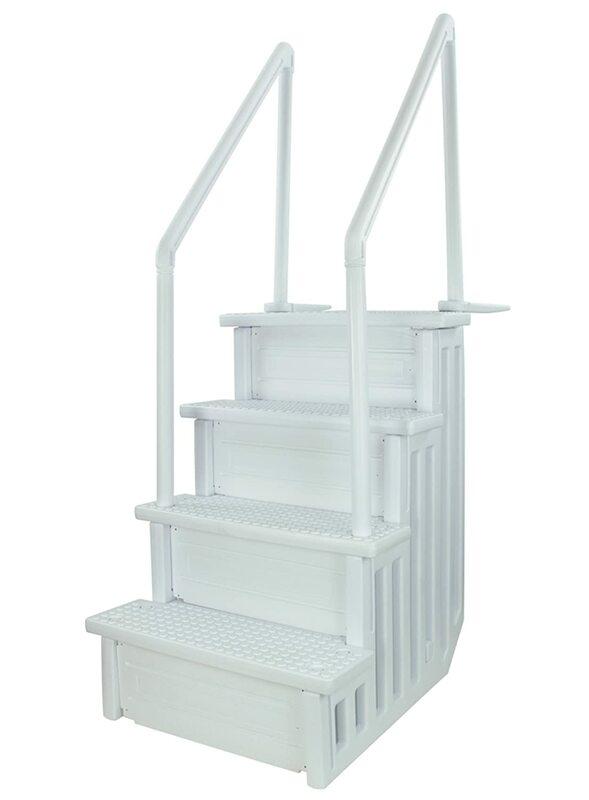 This above-ground pool step and ladder has a 3-year warranty. Read More: Best Wooden Swing Sets and Swing Play Sets for Family Backyard Reviews & Buying Guides. This Above-Ground Swimming Pool Step from Confer has a curved base. The curved base is there to improve the aesthetics and increase the stability of the pool step while it is in water. This particular model of pool step and ladder is breathable in that has perforated steps that allow for the smooth passage of air and water. The passage of air and water prevents the occurrence of dead water areas on the steps. This makes sure that there is no outgrowth of algae and other aquatic micro-organisms that may cause harm to swimmers in the pool. The steps of this swimming pool steps are not overly steep and are comfortable and convenient for both old and young swimmers. The pool step is resistant to slime and will not become slippery. It has double rails that can be removed for more versatility and variety. This pool step is durable, easy-to-maintain, easy to put together, and easy to remove. It is also resistant to pool chemicals like chlorine. This means that this pool step will not rust or corrode when used for extended periods of time in the pool. It has a three-year warranty. This above-ground pool step and the ladder is most suitable for your users regardless of if your pool does or does not have a decked landscape. It is a one-piece step that you can simply drop into your pool. It is extremely easy to assemble and needs no special or technical tools in assembly. It is also easy to disassemble and pack away should you need to store it during winter. It is a seamless, one-piece pool step meaning it is molded and there are no joining or joints thereby resulting in no chips, cracks or increased expanding or contracting of the pool steps with temperature. To anchor this pool step to your pool, you need to fill in the weight container with about 40 pounds of sand. You can also use water to anchor it in your pool. The handrails are to be attached to the deck and your pool step is good to go. This pool step goes in your pool but there is also an outside portion that you may consider buying if you want an A-frame ladder that serves a full-entry function. Read More: Best Punching Bag Stands for Boxing Reviews & Buying Guides. 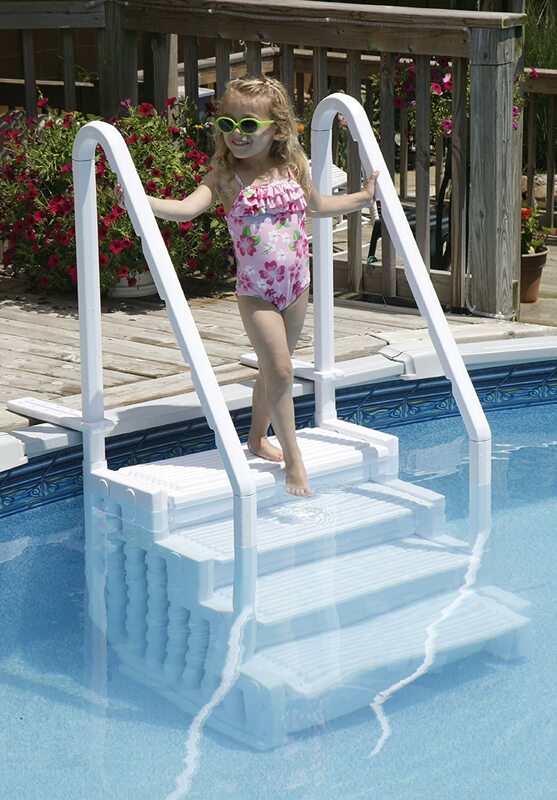 This pool step from Oceans Step is designed to combine an impeccable design with utmost safety. It is most appropriate for pools that are about 45 inches in depth. The steps of this pool are big, wide, rust-resistant and grime-resistant. They offer safety by being slip-resistant so there is not the slightest chance that you could slip on these steps. 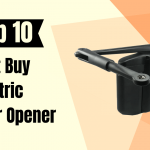 It has double hand rails that have an easy grip and are easy to grab. The handrails can be mounted to the deck with mounting brackets. This increases the stability and sturdiness of the pool step. With this pool step, you do not need sand bags because the side panels are designed to be filled with sand to weigh the pool step down. The pool step also enables water to pass freely over and under the side panels to guard against the growth of algae on the pool steps. This pool step also has an installation manual that enables you to properly install the pool step without stress or hassle. It is especially more relevant for use in pools with flat bottoms. It has a one-year warranty and a maximum weight carrying capacity of 400 pounds. 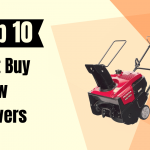 Read More: Best Rolling Miter Saw Stands Reviews & Buying Guides. This pool ladder and step can be assembled in a few short minutes and needs no special hardware or tools. The steps are textured, appropriately spaced and big enough to accommodate anyone. It is best used in pools that are about 54 inches in depth. When it is anchored and weighted down by 40 pounds of sand, it is extremely stable and sturdy. The guard rails are double and provide additional support for swimmers in your pool. The steps and guard rails are slip-resistant. This is a durable and reliable pool step and it a two-year warranty. The whole point of pool steps is to enable you to get in and out of pools very quickly and very easily, no matter how fatigued or tired you are from swimming for a very long time. Above-ground pool steps and ladders should not only get you out of pools, but there are also a few other things that they should do too. Decked or Not- Before you go on a pool step buying spree, you need to consider the kind of landscaping that your pool has. If you do have a deck, the only part of your pool that needs a ladder or pool steps is the inside. Without a deck though, you probably need pool steps on the inside and on the outside to serve as both entry and egress routes, and to make accessing the pool easier and the pool safer for you and your swimmers. Height- For the pool step to pull its weight (figuratively, of course), it has to extend from the top of your pool to comfortably rest on the ground. If you get a pool step and ladder that is too tall, you may be courting trouble. And if you get a pool step and ladder that is too short, well, how would you get out? You can avoid either of these situations by accurately measuring the depth of your pool. Then use the very accurate measurement to determine the height of your pool step. The wider a pool step is, the better it is. This is because a wider step gives more space where you can place your feet comfortably while leaving or entering the pool. Weight- Sometimes, you may need to pull your pool step out of the pool. Make sure the pool step you purchase is not too heavy that you cannot pull it out without injuring or hurting yourself. Durability- Durability encompasses all aspects of the pool step. An above-ground pool step should be sturdy enough that it can comfortably hold the weight of anyone or a group of people on it. A pool step that caves in under the weight of anyone are an accident waiting to happen. So be sure that you buy pool steps that will not hurt you or anyone else. Pool steps should also be relatively easy to clean so that harmful microorganisms do not grow on them. The best material that your pool step can be made of is Steel. Steel does tend to be really expensive and very heavy. And if it is not galvanized steel or stainless steel, it can be difficult to clean and maintain. Galvanized steel will likely not rust because it has been coated with Zinc. Depending on environmental and weather conditions, galvanized steel will last anywhere between forty to fifty years. It, however, needs to be cleaned with an agent that will not damage the integrity of the coating. Some pool steps are made of plastic resin which is pretty easy to maintain, resistant to weather, and long-lasting. Resin pool steps need only be cleaned with resin cleaners and then rinsed thoroughly. Aluminum pool steps are nowhere as strong as steel, but they beat resin pool steps hands down. Aluminum is more often than not used in constructing pool steps railings and frames. Aluminum is often resistant to rust but the parts that are exposed to air still needs to be cleaned with detergent. 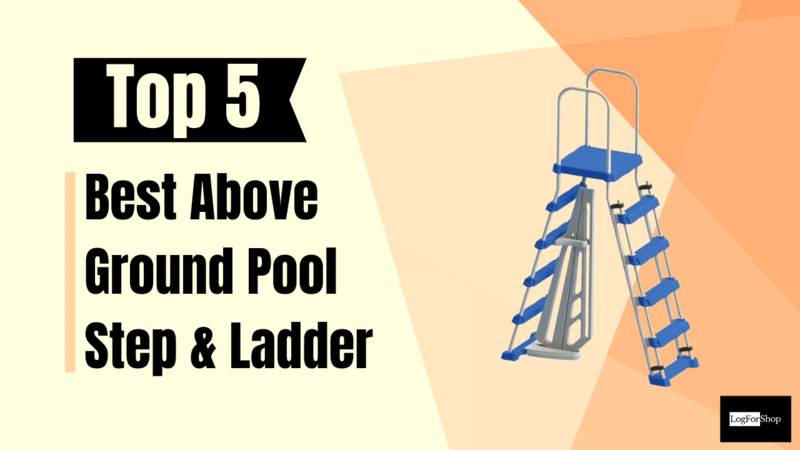 Safety is the most important factor to consider when buying an above-ground pool step and ladder. Maybe buy a pool step with a gate or some sort of barrier to prevent kids from having unlimited and unsupervised access to your pool. Please do not leave kids alone and unattended in the pool. Wash pool steps and ladder as often as it is required so they do not become slippery and cause accidents in the pool. And if you are a beginner swimmer or cannot swim, do well to have a lifeguard around. Swimming pools can be fun but only as long as they do not cause any accidents or put any lives in danger and jeopardy.